The Walt Disney Company announced today that the upcoming D23 Expo 2017 will honor nine contributors to the Disney legacy by christening them Disney Legends. 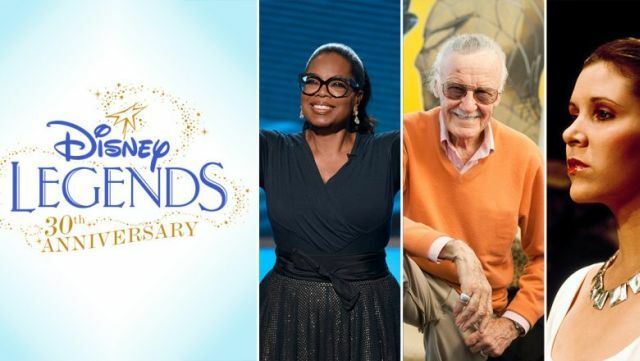 Hosted by Disney Chairman and CEO Bob Iger, the Disney Legends Award ceremony will be held at 10 a.m. on Friday, July 14, in Hall D23 of the Anaheim Convention Center. This year marks the 30th anniversary of the Disney Legends Awards with the first Disney Legend being Fred MacMurray (The Shaggy Dog, The Absent-Minded Professor, The Happiest Millionaire), who was honored in 1987. Julie Taymor is a Tony, Emmy, and Grammy-winning and Oscar-nominated filmmaker who has changed the face of Broadway with her innovative direction. Her adaptation of The Lion King debuted in 1997, becoming the most successful stage musical of all time; 24 global productions have been seen by more than 90 million people. The show has played in more than 100 cities in 19 countries. It received 11 Tony Award nominations, earning Julie Best Director, Costume Designer, and Best Musical for the show. Her production of The Magic Flute is currently in repertory at the Metropolitan Opera in New York City. Her films include A Midsummer’s Night Dream, Titus, The Tempest, the Golden Globe-nominated Across the Universe, and the Oscar-winning Frida. Taymor is a recipient of the MacArthur “Genius” Fellowship and an inductee into the Theater Hall of Fame for Lifetime Achievement. She is currently directing M. Butterfly on Broadway, opening Fall 2017. Oprah Winfrey is a renowned award-winning producer, actress, talk show host, and philanthropist. For 25 years she was the host of the award-winning talk show The Oprah Winfrey Show, which ran for 25 seasons on hundreds of stations domestically and in more than 100 countries around the world. Oprah is also an Academy Award-nominated actress for her role in Steven Spielberg’s 1985 hit The Color Purple. In 1998, she starred in Beloved for Disney’s Touchstone Pictures, a film that she also produced. Oprah also produced and starred in ABC’s 1989 limited series The Women of Brewster Place, and would go on to produce many films for ABC, including Tuesdays with Morrie, Before Women Had Wings, and Their Eyes Were Watching God under the “Oprah Winfrey Presents” banner. She performed as Eudora in Disney’s The Princess and the Frog in 2009 and will co-star as Mrs. Which in Disney’s 2018 film A Wrinkle in Time. Tickets for D23 Expo 2017 are still available and can be purchased by visiting D23Expo.com.